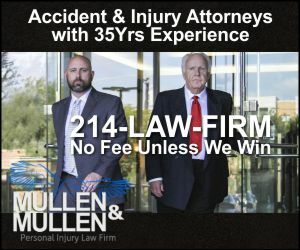 Dallas-Ft. Worth, TX - Accident News and Resources including car, bicycle, motorcycle and truck accidents and much more. Dallas rose to prominence because of its historical importance to the oil and cottown industries. In modern times, the city's economy is primarily based on banking, commerce, telecommunications, computer technology, energy, healthcare and medical research, and transportation and logistics, with a 2013 real GDP of $448 billion. The Dallas-Fort Worth-Arlington metropolitan area has a population of 6.9 million and is only expected to grow. Fort Worth is Fort Worth is the 17th-largest city in the United States and the fifth-largest city in the state of Texas. The city is located in North Central Texas and covers nearly 350 square miles in Tarrant, Denton, Parker, and Wise counties—serving as the seat for Tarrant County. According to the 2013 census estimates, Fort Worth has a population of 792,727. The city is the second-largest in the Dallas–Fort Worth–Arlington metropolitan area. Interstate 20 is an east-west highway that passes through central Texas. The interstate runs from Florence, South Carolina to Kent, Texas. Interstate 30 runs through Dallas and Fort Worth on its way to Little Rock, Arkansas. Interstate 45 is a major road that connects Dallas and Houston. U.S. Route 67 is a 1, 560-mile long north-south highway that begins in Presidio, Texas at the Mexican Border and ends in Sabula, Iowa. It passes through Dallas. U.S. Route 75 begins in Dallas and travels north to the Oklahoma state line, where it continues north to the Canadian border in Minnesota. The Dallas Area Rapid Transit Authority (DART) operates buses, light rail, commuter rail, and high-occupancy vehicle lanes in Dallas and 12 of its suburbs. Dallas has the seventh-busiest light rail system in the country, with approximately 55 stations on 72 miles of light rail. Dallas is served by two commercial airports: Dallas/Fort Worth International Airport and Dallas Love Field, offering services to over 200 destinations both domestic and international. Dallas Executive Airport and Addison Airport serve as general aviation airports in the area. Dallas and Fort Worth truck accidents. When someone has been injured in a motor-vehicle collision in Dallas or Fort Worth, the accident victim and their family members are left with medical bills, lost income, and other costs. When someone is killed due to the negligence of another person or company, a wrongful death claim needs to be launched. It is important to get legal assistance to help the accident victim recover, or when the accident is fatal, to help the family members get fully compensated for their losses. 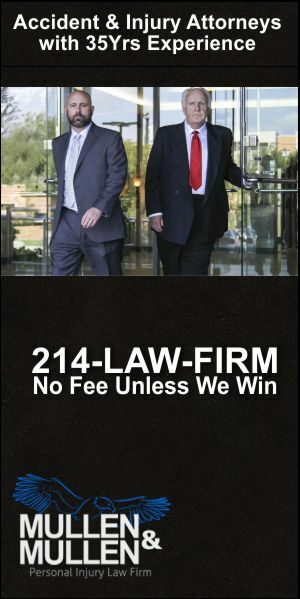 Learn more about how Dallas personal injury attorneys will help injured victims and families. Teens and senior citizens are the most dangerous and vulnerable drivers. But, what may surprise you about older drivers is the nature of the accidents they find themselves involved in. A single negligent decision by another person turned Makynsie Bancroft’s life upside down. But that driver’s decision hasn’t kept her down. We are pleased to announce the winner for our 2019 Regis L. Mullen Accident & Injury Scholarship: Makynsie Bancroft. You’ve probably heard it said that men are more likely than women to get involved in car accidents. But those stats give you perspective! The problem involves taking action. Why don’t you, or maybe one of your family members, stop doing this behavior, despite knowledge that it puts you at more risk for a fatal accident than driving drunk? So, the first question that comes to mind is, “Why does this happen?” Because when you understand the why, then you can work on what to do about it. One person was killed in a crash early Saturday morning after being ejected from their sport utility vehicle. Terri Johnson, a Wise County Justice of the Peace, Juan Jose Rios, 31, Amy Dee Culwell, 35, Sherry Ann Rios, 50, killed, 4-year-old girl critically injured, airlifted to hospital, after a vehicle and SUV collide on U.S. 81/287 near Decatur. Wise County Precinct 2 Justice of the Peace Terri Johnson was killed Saturday evening in a shattering wreck that killed three other people. Student and instructor pilot injured, transported to hospital, after their helicopter crashes during a training flight, near a hanger at the Cleburne Municipal Airport. A helicopter pilot and passenger on a training flight were injured after a crash in Cleburne Friday afternoon. The helicopter came down on the ramp near a hangar at the Cleburne Municipal Airport at about 2:20 p.m.
Eduardo Morales, 20 killed, driver Danny Nicholson, 20, critically injured, airlifted to hospital, after their car, traveling at high speed, leaves the West Wildlife Parkway in Grand Prairie, and crashes into a tree. A 20-year-old was killed and another is in critical condition after a crash in Grand Prairie. It happened in the 600 block of West Wildlife Parkway around 7:30 p.m. Thursday. One bicyclist injured, taken to hospital, after they are struck by a Denton County Transportation Authority commuter A-train at the Lakeview Boulevard crossing in Denton. A bicyclist in Denton has been hospitalized Thursday after being struck by the A-Train. According to the Denton County Transportation Authority, the bicyclist was hit at about 9:15 a.m. near the Lakeview Boulevard crossing. One person killed, one other slightly injured, after two motorcycles collide on Meacham Boulevard in Fort Worth, and one motorcyclist is thrown into the path of an oncoming vehicle. A motorcyclist has died after colliding with another in Fort Worth. Around 11:15 p.m. Tuesday, three motorcycles were heading east on Meacham Boulevard near Mark IV Parkway when two of them crashed into each other, police stated. Tajh Long, 20, one other person, killed, 4 other adults injured, transported to hospital, after a head-on collision between a car and pickup on East Loop 820 in Fort Worth. Two men were killed in a car crash that shut down a highway in east Fort Worth for hours Friday afternoon. Heather Phares, 22, an off-duty Midlothian Police Department officer, was critically injured, airlifted to hospital, after her pickup crashed into the back of a tractor-trailer on State Highway 287 Midlothian. An off-duty Midlothian police officer was seriously injured in a crash Thursday. Betty Tucich, 69, killed, after her minivan rear-ends a dump truck on eastbound U.S. 380 near Frisco. A 69-year-old woman has been killed in a collision with a dump truck in Frisco. Police say just before 1 p.m. Thursday, Betty Tucich, 69, rear-ended a dump truck on U.S. 380 near Preston Road. Christian Vasquez, 15, a student at Booker T. Washington High School, killed, his mother critically injured, taken to hospital, after a stolen minivan, crashes into their car at the intersection of Homer St. and Monticello Ave. in Highland Park. Highland Park police are going door to door in their search for two people who fled from the scene of a deadly crash Tuesday morning in the M Streets area. Extra psychologists are at William B Travis Academy in Uptown Dallas Wednesday where 13-year-old Ethan Vasquez attended school. A crash in Lamar County early Sunday morning killed three teenagers and sent five others to hospitals. Jennifer Lunow, 35, killed, Danny Lunow, 5-year-old daughter injured, transported to hospital, after their single-engine aircraft crashes on Masch Branch Road near the Denton Municipal Airport. A wife and mother died after a plane crash in Denton County. Marion Nathan, 64, killed, after her car is struck, at the intersection of W. Kiest Boulevard and Coombs Creek Drive in the West Oak Cliff area of Dallas, by a speeding car who's driver was arrested. A 64-year-old woman was killed in a two-car crash Tuesday night in West Oak Cliff. Angel Reyes, 14, Ricardo Hernandez,10, killed, two other children injured, after their SUV, driven by their mother, Crystal Suniga, 30, who was injured and arrested, loses control, strikes a curb and overturns on East Pioneer Drive in Irving. An Irving woman faces intoxication manslaughter charges after a Saturday night car crash that killed two of her children and injured two others.